After facing many health issues early in life and getting no answers from our modern medical system, Olivia turned to self healing. She studied Traditional Chinese Medicine and investigated all she could on what we eat and the pitfalls of the standard American diet. She created Organicolivia.com to document her journey and spread the truth aboutingredients, GMOs, nutrition, avoiding toxins and alternative medicine. In collaboration with her Mentor Lily, Olivia has launched a Parasite cleanse kit and the new and improved version will be available soon. When an animal, such as a dog or cat, is sick, its natural instinct is to refuse food. When the crisis is over, and the internal healing work has been accomplished, the appetite will return naturally, of its own accord. The human organism also has a fasting instinct, just like that of other animals. This is why when you are sick, you don’t feel like eating. The mind gets clearer, and spiritual awareness deepens. After you are freed from having to satisfy physical hunger, you can then turn your attention to feeding the mind and spirit. In fact, spiritual masters like Pythagoras wouldn’t admit any disciple into their higher teachings unless they had first purified themselves through fasting. Physically, fasting enables the organism to detoxify and clean house. 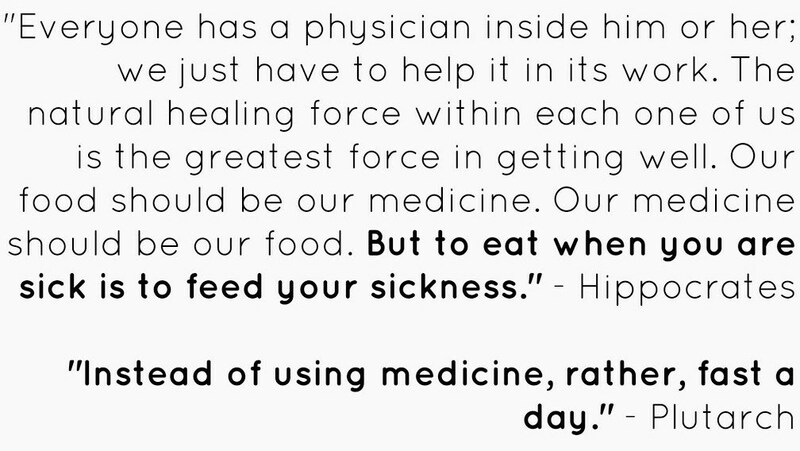 Because the vast majority of diseases are caused by autointoxication, fasting has wide-ranging therapeutic benefits. It gives the digestive organs a much needed rest, so your body can devote its digestive energy to healing. For all fevers and diseases in the acute crisis stage, Hippocrates prescribed either a strict fast with nothing but water or medicinal teas, or a very slender liquid diet. Fasting is also recommended for colds and flu, arthritis and rheumatism, digestive complaints, as well as all metabolic disorders. Scientific experiments conducted on laboratory mice have shown that severe restriction of caloric intake greatly extends their lifespan. Since this is basically what fasting is, fasting holds great promise for life extension. Head / Brain: headaches, dizziness, vertigo, wooziness, lightheadedness. Nose, Sinuses: sneezing, runny nose, itching, stinging, post nasal drip. the ribs on the right side. Gall Bladder: colic, spasm, tenderness or pain underneath the liver area. Intestines: foul smelling gas, cramping, diarrhea, spastic colon or irritable bowel. strongly colored or smelling urine.